Now here’s a surprise. Since they revitalized the Sam & Max series six years ago, Telltale Games have been consistently pumping a range of (mostly licensed) adventure games that all share the common theme of being episodic in structure. Back then, episodic gaming was on the cusp of being the next big thing with Sam & Max, Alone In The Dark and Siren all trying their hand at the format. Most of the games received pretty average reviews however and nowadays its only really been Telltale that have persisted with this format. I’ve tried my hand at a couple of the Telltale games (Sam & Max, Puzzle Agent) and found that while the writing has been reasonable, the play mechanics have been too convoluted and tedious for me to see them through. I was drawn back to give Telltale another go when I heard glowing write ups about their adaptation of The Walking Dead franchise. I downloaded the first game and tried it out for myself. It took the better part of two hours but I was completely hooked and finished the first episode in a single sitting. It’s a minor miracle what they’ve accomplished here: a near perfect adaptation of the comic book that recreates the tone and themes of the source material exceptionally well. Possibly even better than the television series. The Walking Dead game is a prequel which covers the initial zombie outbreak in Atlanta before we are introduced to the main protagonist from the comic book series Rick Grimes. Instead, we see the world through the eyes of Lee Everett, a man who was being sent to prison for the murder of his wife, who he discovered in bed with the local senator. As Everett, the player is given a wide range of dialogue options so its possible to establish the character as a brooding silent type, an aggressive survivalist, a compassionate man who’s been wrongfully accused or some sort of amalgamation of the above. Over the course of the first episode, you’ll be forced to make some difficult decisions and many of those choices appear to carry over into what happens during the rest of the season. The art style in the game, which gives it the appearance of a colourized version of the comics is excellent. It helps give an endearing and attractive look to what is actually a rather basic graphics engine under the hood. Everett’s eyes are sad and expressive, offering plenty of emotion and intrigue as to his past. The brush-stroke style means that using minimal horsepower, Telltale can construct a convincing facsimile of Kirkman’s vision of the American South. Credit must be given to creators Jake Rodkin, Sean Vanaman and writer Gary Whitta for they have built the game to match the pace and tone of The Walking Dead comics and not the other way around. A lesser developer, and to be honest I suspect most developers, would have simply pasted the license onto a zombie shooter. What we have here instead is a slow, methodically paced game which introduces a range of interesting and engaging characters – a truck driver trying to keep his family alive, a journalist with a talent for firearms, a pastor who offers shelter on his farm. Some of these characters are taken straight from the comic, others are original creations. 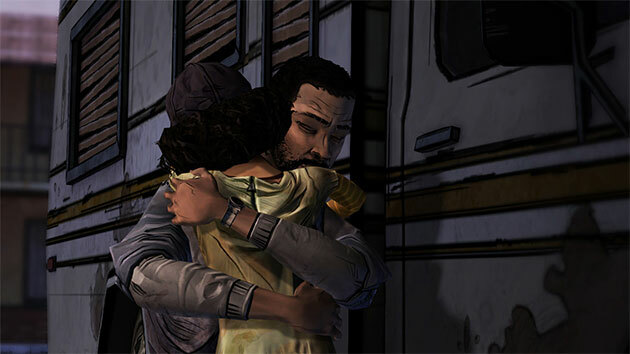 All fit the feel of The Walking Dead universe and grab your attention because how often do you get to interact with a middle aged Georgian truck driver or a ten year old African American girl in a video game? The writing in the game feels comparable to Robert Kirkman’s style in the comics. The main characters are mostly a sad and introspective lot, trying to come to terms with the zombie apocalypse and how it alters their views on spirituality, morality and humanity. The game is wise not to have a never-ending hoard of zombies to contend with and gives the player plenty of quiet down-time to absorb the characters and their surroundings. All of this is done so well that not only am I excited for future installments of The Walking Dead game series, it has me hopeful that other developers with aspirations for a stronger narrative in their games learn from what Telltale have created here. It would have hugely dimished the appeal of the game if the developer opted to bog down the player’s progress with too many obtuse puzzle mechanics, so often associated with the adventure genre. Or filled the game with repetitive encounters with zombies. Moderation is the order of the day and even though two hours might seem like a short experience, whats on offer is immensely heightened by the sense of flow that the game has. By using the zombie attack scenes sparingly, there is some genuine tension when the scenes occur. I am far more likely to revisit this game and play it through from scratch because its not bloated with filler. I feel this has been the problem for many larger developers this generation (Rockstar, Bioware etc) who have an interesting story to tell but feel compelled to wrap it around 30 hours of padded gameplay because of a certain expectation of what video games are supposed to be. 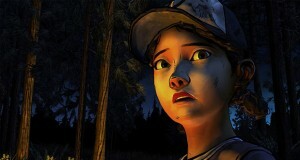 The Walking Dead is not a particularly challenging or deep game. It is linear and short from start to finish. But it captures the qualities of its source material so well that it becomes a welcome part of The Walking Dead canon which I’m sure fans of the franchise will warmly embrace. I look forward to seeing where the series goes from here and hope its lean and efficient approach to storytelling becomes an influence on others in the games industry. Summary : Janky frame rate aside, this game shows incredible promise. Telltale might be onto something here.